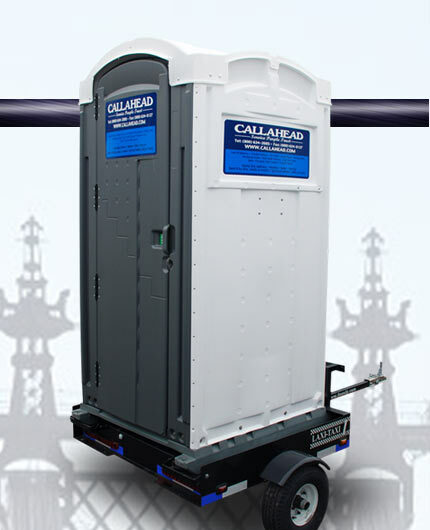 The best thing about the HEAD TRAILER, you can select from CALLAHEAD's wide variety of standard sized portable toilet rentals to accompany your TRAILER HEAD rental. For example, you have a jobsite deep inside a tunnel that has limited access to pump service trucks and flatbed vehicles. However, the jobsite requires a full sized porta potty rental for the comfort and sanitary protection of the construction crew. The HEAD TRAILER allows you to transport a regular sized portable toilet inside tunnel construction sites by attaching to any smaller sized vehicle to transport the portable restroom of your choice, even when full, without any difficulty. 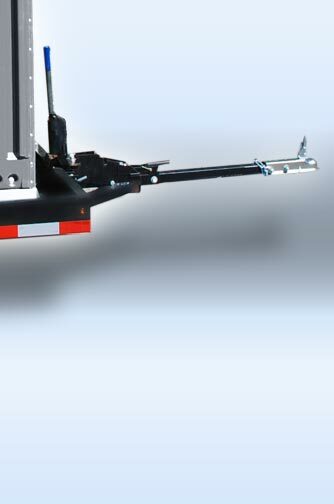 Dimensions - 4' L x 4' 2" W Weight – 1,500 lbs. 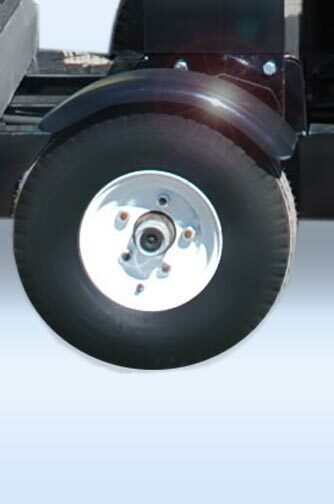 Tows easily on the high-way Tires – 5.70-8 Tail lights for driving safety Carries one standard size portable toilet Safety chain length – 24" (chain only) Easy crank handle even when portable toilets are full Lockable anti-theft tongue Portable toilet can be used on or off the HEAD TRAILER. • The RED HEAD portable toilet is a popular rental for road and bridge construction jobsites. Because road work and highway construction can commonly go on for miles, the HEAD TRAILER rented with the RED HEAD porta potty is a perfect combination. 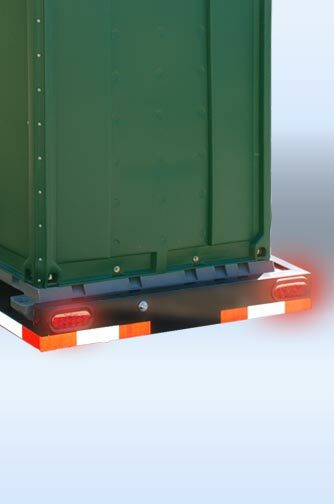 This port a potty's bright red coloring will get your construction sight noticed and alert traffic to slow down for the safety of the construction crew. The RED HEAD is also designed with an Asian themed circular CALLAHEAD signage that adds style to any location. • A WHITE TOILET is one of the favorite portable toilet rentals for any type of long term construction job in New York because ofits clean and crisp white color. 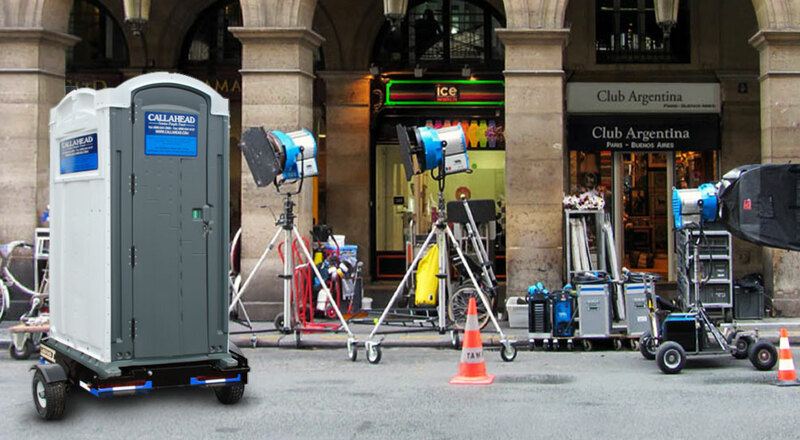 This portable toilet is one that you will not only see, but feel it's clean. The WHITE TOILET fits securely on the HEAD TRAILER to be transported to any location with ease. 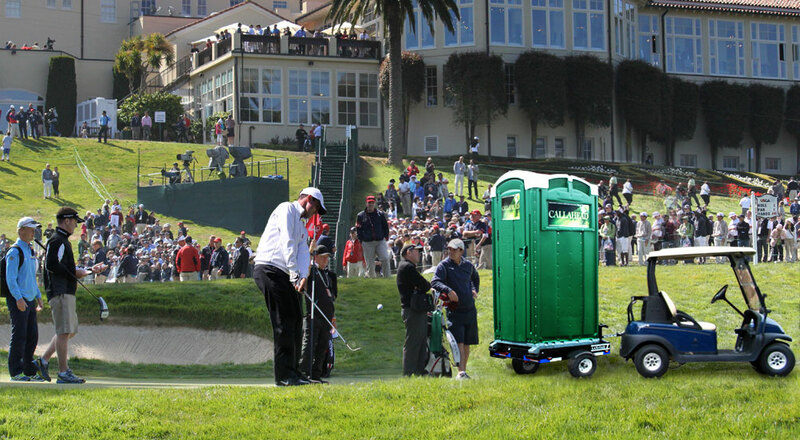 • The GREEN HEAD is a frequently rented full sized portable restroom for home construction sites, golf courses, and park grounds because its garden theme blends right in with their landscaping. The HEAD TRAILER is an ideal combination to move a portable toilet withoutuse of a large heavy truck to help preserve lawns and other landscaped areas. • The BLUE WATER TOILET is a long-term portable toilet rental that looks great near water locations such as beaches, lakes, and marinas. You can imagine the difficulty you'd have transporting a portable toilet on a beach or dock of a marina if you can't fit the flatbed truck through. The HEAD TRAILER is the answer to smoothly carry your BLUE WATER TOILET, even when full, into these waterfront locations. 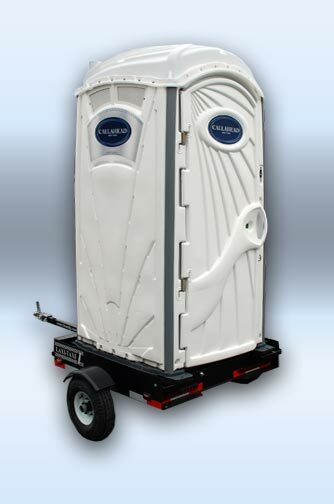 • The CONSTRUCTION WASH & FLUSH is a full service portable restroom for any construction site. Providing both bathroom and hand washing capabilities, it is the perfect portable toilet rental with its orange and grey coloring to match the machinery and cement at the jobsite. Even with this full sized, full service porta potty rental, the HEAD TRAILER can transport the CONSTRUCTION WASH & FLUSH effortlessly. There are dozens of CALLAHEAD standard sized portable toilets to choose from with your HEAD TRAILER portable toilet trailer. 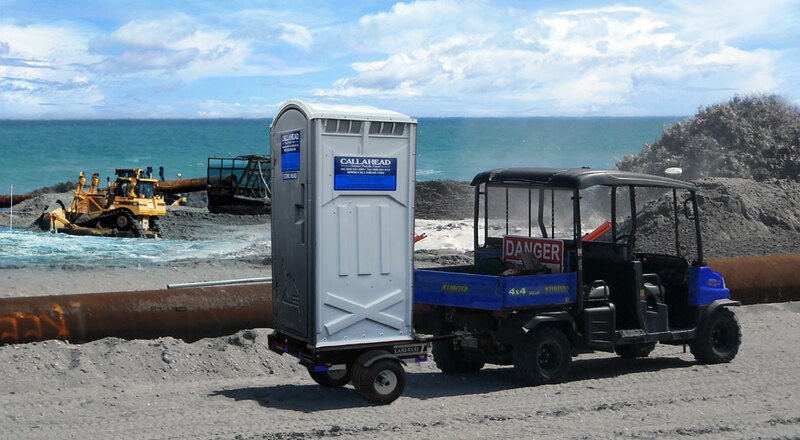 No matter if you are renting a portable toilet for a long-term construction project on the highway, or a short-term portable toilet rental on the beach, CALLAHEAD's HEAD TRAILER will make moving your full sized portable toilet a snap. The Head Trailer shown carrying the CONSTRUCTION WASH & FLUSH. Do you need to move your New York bathroom trailer rental from one location to another regularly at the construction site? Maybe you require your portable toilet at a location that is off the beaten path or within an agricultural area. Many jobsites on or near park locations don't permit access to flatbed trucks or tank truck vehicles, making it difficult to get a portable toilet to these locations for delivery, pick-up and cleaning services. 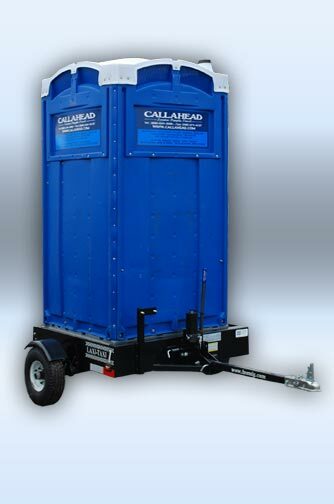 CALLAHEAD's HEAD TRAILER is the perfect solution to transport any free standing portable toilet quickly, easily, safely, and without harming any landscape. The HEAD TRAILER is a trailer that was specifically designed and engineered to transport standard sized porta potties with minimal effort. With the HEAD TRAILER, you can have a full sized portable restroom towed by a simple golf cart, garden tractor or other small vehicle to protect the lands. 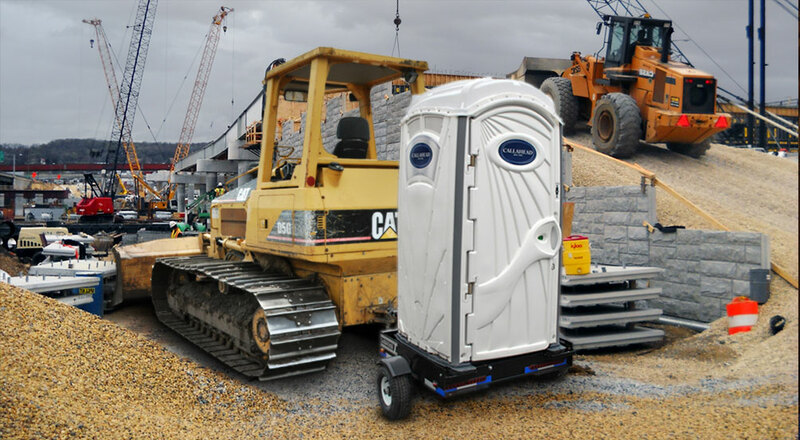 Also ideal for road construction jobs, the portable toilet can follow construction crews as they move around the jobsite. 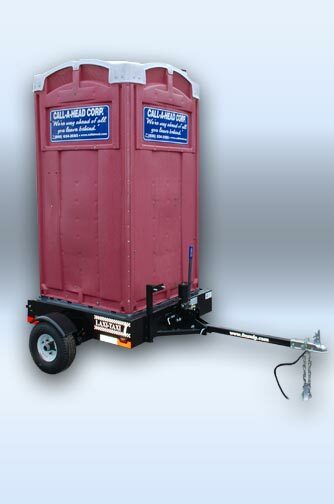 Moving a full portable toilet at the construction site has never been easier than with the HEAD TRAILER. In addition, you don't ever have to remove the portable toilet from the HEAD TRAILER to use it unless you want to. After transporting the portable toilet to your desired New York location, the HEAD TRAILER effortlessly lowers the porta potty to ground level for safe and easy access. When you are ready to move the full sized portable toilet to the next location, simply crank up the HEAD TRAILER to lift the port a potty, and your portable toilet is ready to move with the construction crew to their next location. CALLAHEAD is the #1 portable sanitation company in New York. 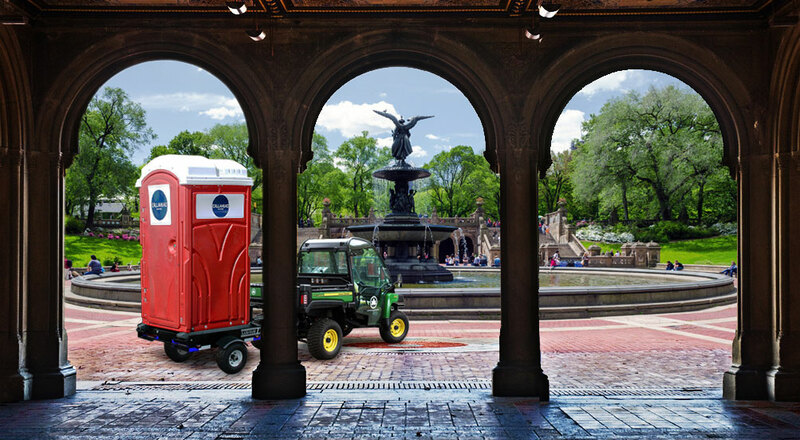 We have been supplying portable toilets since 1977 throughout New York City’s five boroughs of Manhattan, Brooklyn, Bronx, Staten Island, and Queens, Nassau and Suffolk Counties on Long Island, and all of Westchester County. Our dedicated staff is here to assist you any way possible to supply you with the best portable toilet equipment and service in New York. Quality service that begins from the moment you call our office to inquire about our products and throughout your entire rental of any one of our products. When you rent a CALLAHEAD you’re renting from New York’s best portable toilet company hands down. The Head Trailer for Convenience! The Head Trailer is Truly Portable!